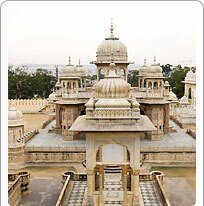 Gaitore is the royal cremation site for the ruling family of erstwhile Jaipur State. It is located on the Jaipur Amber highway at a distance of 15 km from Jaipur. The site has cenotaphs, known as Chattris for each Maharaja. The cenotaphs are exquisitely carved and attract a large number of tourists. Gaitore is said to be derived from the Hindi phrase 'Gaye ka Thor' meaning the final resting place. The designs on each Chhatri represent the taste of the particular Maharaja to whom it is dedicated. The cenotaph of Maharaja Sawai Jai Singh II is most notable for carvings and paintings. The quality of workmanship at Gaitore is also another tribute to the royal past of Jaipur.